If you are concerned that you may have a leaky gut and are looking for solutions, check out the Leaky Gut Mini-Course! Gut is the colloquial term for the gastrointestinal tract (also called the GI tract, digestive tract, digestive tube, or gastrointestinal system), an organ system composed of the esophagus, the stomach and both the small and large intestines. The gut is a major component of the digestive system—a greater organ system composed of the entire gut as well as the liver, pancreas, gallbladder, tongue and salivary glands—responsible for digesting the foods we eat, absorbing nutrients, and expelling waste. The foods we eat are digested inside the gut as they travel from one end to the other. Digestion is the chemical and mechanical breakdown of foods into small molecules, or nutrients, that can be absorbed into the body. Nutrients, the many substances essential for growth and the maintenance of life, consist of a diversity of chemicals: amino acids, which are the building blocks of proteins; fatty acids, which are the building blocks of fat but also a critical component of every cell’s membranes; monosaccharides, which are the simplest carbohydrates and which our bodies use for energy; vitamins and vitaminlike compounds, which are used in a vast range of chemical reactions in our bodies; minerals, which are important building blocks for many structures in the human body in addition to facilitating chemical reactions, nerve conduction, and electrolyte balance; and phytochemicals, which are important antioxidants and which are also used in chemical reactions. Fiber is also an important nutrient, but not because it’s absorbed into our body. Instead, fiber feeds the bacteria that live in the small and large intestine, supporting the health of this microbial community, collectively referred to as the gut microbiota. Only relatively small molecules can cross the gut barrier to enter the body, which is why digestion is a prerequisite for nutrient absorption. Nutrients are absorbed by passing through the lining of the gastrointestinal tract (via several pathways) and into the circulation (either blood or lymphatic vessels depending on whether the nutrient is water or fat soluble). Nutrients are then carried throughout the body; every part of every cell, every chemical reaction within every cell, every signaling molecule (like hormones) and even the extracellular matrix (the glue that holds our cells together) use nutrients. If nutrients are not needed immediately, they are either stored for later use, or excreted. Supplying nutrients to our body is clearly a very important job, and without the gut to accomplish this vital function, we would be unable to survive. However, digestion is just the tip of the iceberg when it comes to the gut’s contribution to our health! The gut is essentially a really long tube, open at both ends which makes the interior of the gut an extension of the external environment. 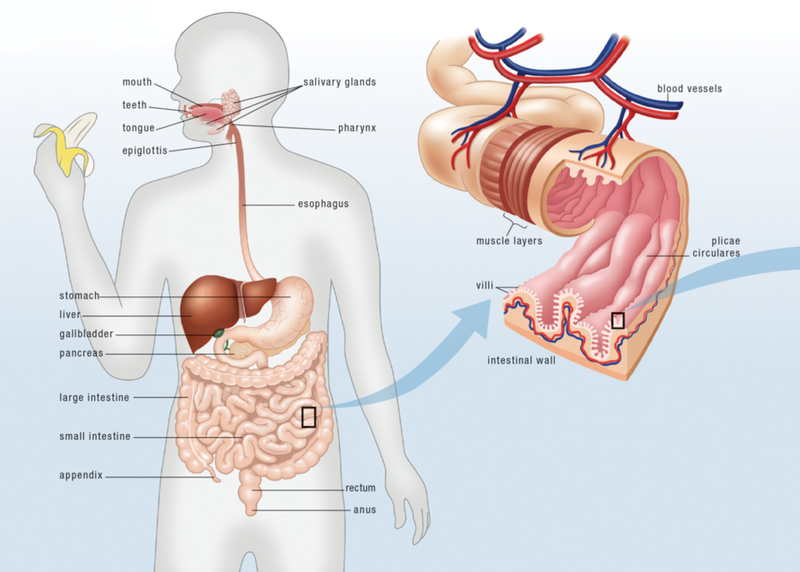 Yes, inside the gut is considered to be outside of the body since the gut’s contents can only enter the circulatory system by crossing the highly sophisticated gut barrier. In fact, the gut provides the largest amount of contact between the interior of our bodies and the outside world, far more than our skin, with an area estimated to be about the size of a tennis court! Digestion of consumed foodstuffs into small molecules is necessary for the proper functioning of the gut barrier. The gut barrier, also called the intestinal barrier, is semipermeable. It protects our bodies by being permeable to nutrients while blocking everything else in the gut—including compounds in foods that our bodies can’t use but also toxins, pathogens and the trillions of bacteria that live in our guts—from entering the body. What we can’t absorb from our foods either becomes food for the bacteria that live in the small and large intestines or is eliminated as waste. Because the gut acts as the largest barrier between our bodies and the outside world, repelling foreign invaders is another key function of the gastrointestinal tract. The gut has the very tricky job of letting nutrients into the body while keeping bacteria, viruses, parasites, other pathogens and toxins from entering the body. To achieve this function, the gut is equipped with an array of physiologic defense mechanisms, including mucus, digestive enzymes, acid, and most of our immune systems! In fact, the gut houses approximately 80% of our immune systems within the largest collection of lymphoid tissue in the body, termed the gut-associated lymphoid tissue (GALT). The first line of defense against large molecules like pathogens entering the body is digestion, with saliva, gastric acid and enzymes, and pancreatic enzymes all exerting a toxic action on microorganisms via the destruction of their cell wall. If a pathogen escapes degradation, there are two mechanisms that prevent adhesion to the wall of the gastrointestinal tract. Peristalsis, the coordinated contraction and relaxation of muscle tissues to propel the contents of the gut from one end to the other, contributes to gut barrier function by limiting the amount of time any particular pathogen might have to adhere to, colonize or cross the intestinal barrier. 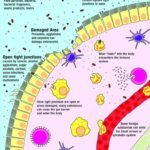 The entire intestinal surface is lined with a mucus layer, produced by specialized cells embedded within the intestinal wall, that acts as a physical barrier to pathogens but also contains a variety of antimicrobial compounds to destroy any infectious microbes that may enter the mucus layer. 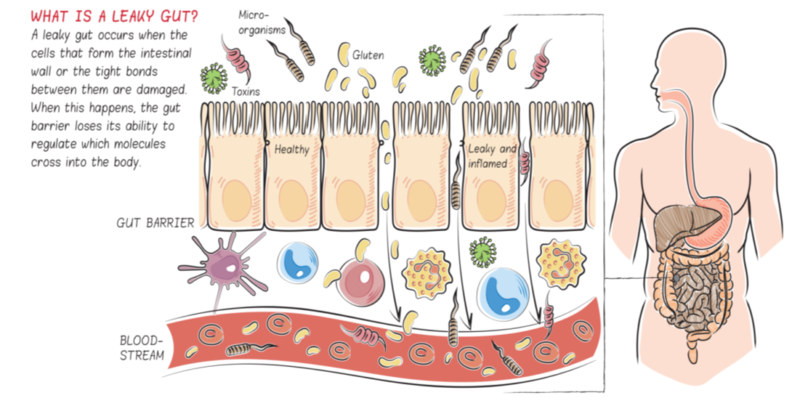 The specialized cells that form the majority of the intestinal wall, a type of epithelial cell called enterocytes that connect firmly to each other to form a continuous layer, also form a physical barrier to large amounts of pathogens. Whatever makes it through these defenses are then confronted with the immune system. 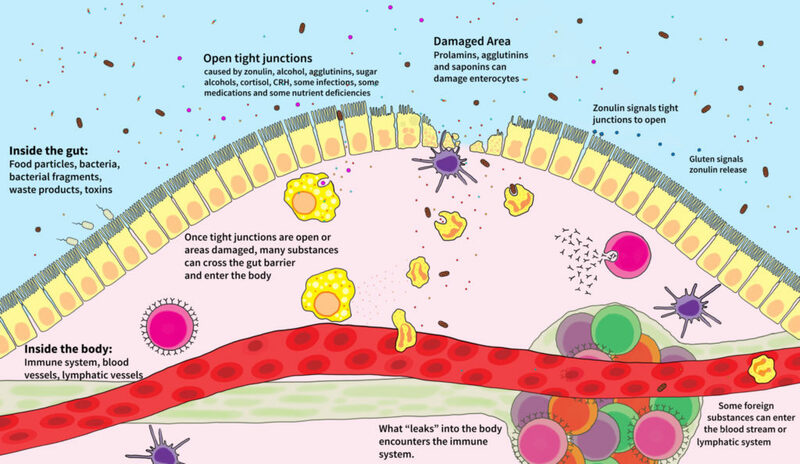 Just inside the epithelial cell layer of the intestinal wall lies a vast array of resident immune cells acting as sentries, ready to protect the body from attack. Even in normal circumstances, a constant barrage of large molecules—including partially digested food particles, pathogenic organisms, and the normal microbiotic residents of our guts—crosses into the body and must be identified and destroyed by the immune system. A variety of cell types accomplish this job, recognizing and cleaning up harmless substances, targeting harmful agents and mounting either a local or systemic immune response, and remaining constantly activated in a state of vigilance called “physiological inflammation”. Food must be broken down into its simplest forms in order to cross the lining of the small intestine. This breaking down is achieved by the combined efforts of acid and digestive enzymes produced by the cells that line the stomach, bile salts made by the liver and stored in the gallbladder until needed, additional (and different) digestive enzymes made and secreted into the small intestine by the pancreas, and even our gut microbiota (the friendly bacteria that live in the gut). Before being absorbed into the body, proteins must be broken down into amino acids, fats must be broken down into fatty acids, and carbohydrates must be broken down into monosaccharides (simple sugars). Once food is broken down into its simplest components, the cells that line the gut transport those components from inside the gut to inside the body. Amino acids, monosaccharides, minerals and water-soluble vitamins are transported through the blood, while fatty acids and fat-soluble vitamins are transported through the lymphatic system. It’s important to understand just how essential the barrier function of the gut is to human health, because, as previously mentioned, loss of that function is a critical factor in autoimmune disease. What Happens When the Gut Leaks? A leaky gut occurs when either individual or groups of enterocytes are damaged or the proteins that form the tight bonds between these cells and hold them together as a solid layer are damaged. When this happens, microscopic holes are formed in the intestinal lining through which some of the contents of the gut can leak out into the bloodstream or lymphatic system—and, most important, straight into the waiting arms of the resident immune cells of the gut. What leaks out isn’t food, but a combination of pathogens: incompletely digested proteins; bacteria or bacterial fragments from those friendly bacteria that are supposed to stay in your gut; infectious organisms if they’re present in the gut; or a variety of toxic substances or waste products that would normally be excreted. When these pathogens leak through those holes, the resident immune cells of the gut recognize them as foreign invaders and mount a response against them, recruiting more immune cells from the gut-associated lymphoid tissue. When large quantities of pathogens escape, other parts of the body, especially the liver, also contribute to the response—revving up bodywide inflammation and sending the immune system into overdrive. Exactly what and how much leaks out determines the precise nature of this immune response. Some pathogenic substances (like bacterial fragments and toxins) cause generalized inflammation by triggering the release of inflammatory cytokines (the chemical messengers that circulate in the blood and tell white blood cells to attack) that recruit the cells of the innate immune system. Recall that this type of inflammation has no specific target, so any cell in the body can be an innocent victim. These toxins must typically be filtered by the liver. When the liver is overworked, the toxins accumulate in the body and the inflammation spreads and begins to trigger the adaptive immune system to join in the battle. This type of inflammation can be a major contributor to a variety of health issues, not just autoimmune disease. Other substances (like incompletely digested proteins or other undigested food particles) stimulate the adaptive immune system, which responds in a variety of ways, producing ailments such as allergies and autoimmune disease. An allergy results when B cells secrete IgE antibodies that target a part of a protein that is specific to the food it originated from: antibodies targeting the casein in milk causes a milk allergy, for example. A similar immune response occurs when B cells secrete IgA, IgD, IgM, or IgG antibodies. This type of immune response is technically considered a food intolerance (and not an allergy) but can cause both allergylike symptoms and symptoms you might not normally attribute to an allergy, such as pain, fatigue, and eczema. Some of the antibodies produced may also be autoantibodies, leading to the development of autoimmune disease. The release of cytokines is also stimulated, which stimulates further recruitment of cells from both the innate and the adaptive immune systems. In some individuals, a leaky gut can develop slowly—over years or decades. Stress, sleep deprivation, and some infections may make matters worse very quickly (and unpredictably). Once you have a leaky gut, it is only a matter of time before other ailments begin to crop up. Depending on the extent of the damage to the gut lining, the exact substances that leak out, and your specific genetic makeup, the inflammation and immune reactions caused by a leaky gut can add up to any of a huge variety of health concerns, many of which can be life-threatening, including autoimmune disease. The gut can become leaky for a variety of reasons, but they all have their root in diet and lifestyle factors (including insufficient sleep, inactivity, overtraining, and chronic stress). Other causes of a leaky gut include medications, such as corticosteroids and NSAIDs, and infections (parasites, candida, some bacteria…). In the case of short-term courses of medication or infections, what keeps the gut leaky afterward is the extra negative impact of diet and lifestyle. In the case of chronic infections, diet and lifestyle factors weaken the immune system to the point that it can’t deal with the invading microorganism. Gut flora imbalances (aka gut dysbiosis) can also directly cause a leaky gut. You may or may not know that you have a leaky gut. You may or may not have gastrointestinal symptoms. The destruction of the small intestine’s barrier causes inflammation, which may not cause overt symptoms in the earlier stages of disease. Reduction of surface area for nutrient absorption can cause micronutrient deficiencies (deficiencies in vitamins and minerals), which may manifest in a variety of ways. Damage to the enterocyte layer may result in lactose and fructose intolerance, and the inability to properly digest fats and absorb fat-soluble vitamins, but you may not attribute those to a leaky gut. In any event, if you suffer from chronic disease, the chances are extremely high that you have a leaky gut. There is certainly some controversy on whether leaky gut is the chicken or the egg when it comes to chronic illness, see Which comes first: the leaky gut or the dysfunctional immune system? for more information. There are several ways in which the epithelial barrier can be breached and damaged. Some proteins bind to carrier molecules in the brush border of the epithelium, tricking the enterocytes into transporting them across the barrier. Some proteins irritate or damage the cells. Some affect the bonds between enterocytes. Enterocyte Damage: Damage or destruction of the cells that line the gut occurs when certain substances interact with those cells. These substances include pathogens and toxins but also some specific dietary proteins, the most important of which are prolamins, agglutinins, and saponins, which are found in abundance in grains, legumes, and nightshade vegetables (see Why Grains Are Bad-Part 1, Lectins and the Gut, Are all lectins bad? (and what are lectins, anyway?) and How Do Grains, Legumes and Dairy Cause a Leaky Gut? 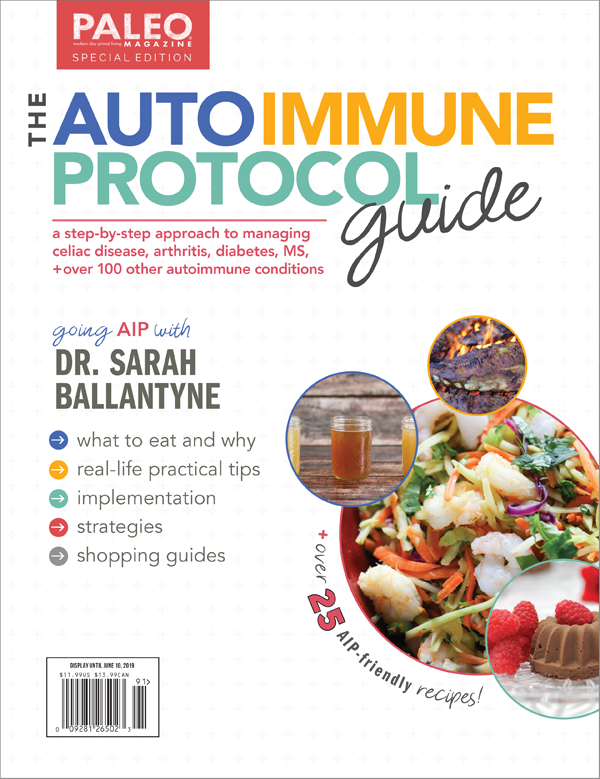 Part 2: Saponins and Protease Inhibitors and The WHYs behind the Autoimmune Protocol: Nightshades) If an enterocyte dies, it leaves a hole in the gut barrier through which the contents of the gut can leak out. These holes are rapidly closed in a healthy individual. But when enterocyte death becomes rampant (as is the case in people with certain infections, or who are sensitive to gluten and prolamins, or who eat many prolamin-, agglutinin- and saponin-rich foods, or who have gut dysbiosis, or who have certain genetic tendencies), the body cannot keep up with the necessity for repair, and a leaky gut develops. A confounding factor for many people is a diet deficient in important nutrients required for effective repair of the gut barrier. Tight Junctions: The cells that line the gut are bound together by structures known as tight junctions. The tight junction is a complex of many different proteins that extend from the inside of the cell through the cell membrane to the outside of the cell. These proteins fold in such a way as to weave together with proteins from the adjacent cell and form a tight connection. This tight connection is essential for the barrier junction of the intestinal epithelium. Beyond this function, the tight junctions are also responsible for dividing the cell membrane of the enterocytes into two components, the apical membrane (the “top” of the cell, or the part that faces inside the gut) and the basolateral membrane (the “sides” and “bottom” of the cell, or the part that faces inside the body). Because these parts of the cell membrane have different functions, a properly functioning tight junction is critical to a properly functioning cell. In fact, loss of what is called epithelial cell polarity (the cell’s ability to know the difference between its apical and its basolateral membranes) occurs when tight junctions are not functioning properly, and this is an essential precursor to cancer. There are many ways the tight junctions can unravel and open up. In fact, these are not static structures, but are designed to open and close so specific nutrients can be absorbed. The problem occurs when the normally highly controlled regulation of the tight junctions fails and the tight junctions are left open. This not only creates pores through which substances inside the gut can leak out into the body, but if the situation persists it also can signal to the cell to go into apoptosis (i.e., commit cell suicide). See The WHYs behind the Autoimmune Protocol: Alcohol. One mechanism through which tight junctions are opened is zonulin. Zonulin, a protein secreted into the gut by the enterocytes, is supposed to regulate the rapid opening and closing of tight junctions. However, it is now believed that zonulin may play a critical role in the development of autoimmune disease. Patients with celiac disease are known to have increased zonulin levels, stimulating the opening of more tight junctions and probably keeping them open for longer. In these patients, the secretion of zonulin is stimulated by the consumption of gluten (or, more specifically, the protein fraction of gluten called gliadin). Increased zonulin production, also in response to gluten, also causes a leaky gut preceding type 1 diabetes. It is believed that this mechanism may be at play in all autoimmune diseases, which also implies that gluten and similar proteins found in other grains and pseudograins (the starchy seeds of broad-leafed plants such as quinoa) may contribute to leaky gut in all people suffering from autoimmune disease. Tight junctions are also opened by elevated cortisol levels, some medications, some infectious microorganisms, and perhaps as yet unidentified substances. Eliminating foods that contain compounds that can increase intestinal permeability is step 1 in healing a leaky gut, however nutrient density and lifestyle factors are also essential! Some nutrients are absolutely key for a healthy gut barrier (link zinc, which 73% of Americans don’t get enough of, see also 8 Nutrients for Leaky Gut). See What Should You Eat To Heal a Leaky Gut? and Why Exercising Too Much Hurts Your Gut. The most thorough resource for a deep dive into repairing a leaky gut and restoring a healthy and diverse gut microbiome is The Leaky Gut Mini-Course. A truly excellent explination of this topic. Thank you! Wonderful post. I am learning, learning, learning about this condition at the ripe age of 54 and trying like crazy to repair the awful damage I have done to myself. I’ve been low carb and traditional for the past year. I am getting there but I know I have another year at least to boost my immune system. Its a slow battle. But I’m fascinated with this topic. I have read the GAPS book which I need to tackle again since it was kind of over my head at the time. But I’m getting there. I wish I knew about this or would have believed in it when my son was younger because he has ADD and is now 23 and won’t give up processed food. Maybe with time I can convince him. Anyway, thank you again. I swear it was the grass fed bone broth. Ok, my gut is so severe I cant handle bone broth. Any suggestions? Meat stock is gentler than bone broth. The GAPS book talks about using it first. Where do you get it or do you make it? P. S. I’m leaning more Paleo all of the time. My actual question was if you have any feelings about raw milk and it still being banned from Paleo eating. I’d like to keep raw milk (on very few occasions) but yogurt and dairy more, all grass fed. I have signed up today to get your email thanks to your Paleo Parents link. Thanks Molly! I think that grains and legumes are more damaging to the gut than dairy, so it would be more important to cut those out first (and cut out modern vegetable oils and excess sugars too). 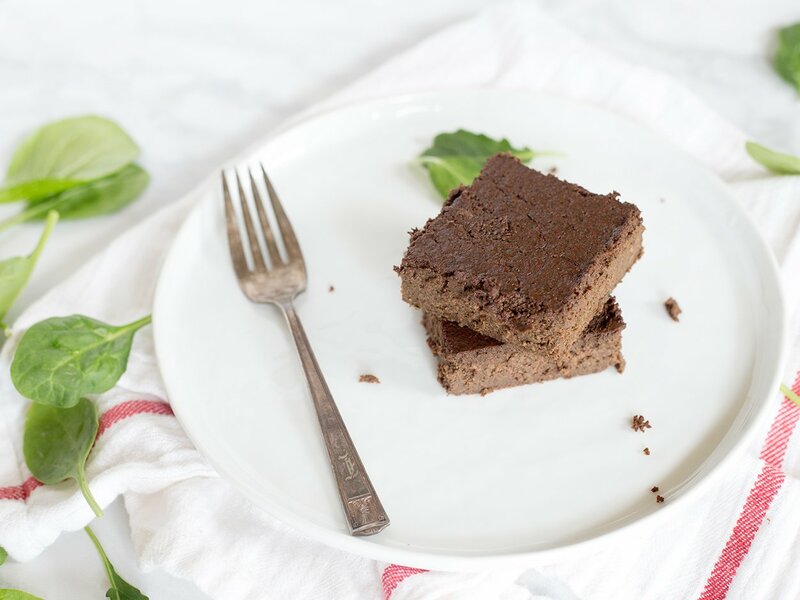 The benefit or harm that might be caused by dairy, especially raw grass-fed dairy, is one of the more contentious issues in the Paleo community. I personally believe that milk can be okay for some people and not for others. You won’t really know how good it is for you until you cut it out for a while (at least a month, three would be better) and then try re-introducing small quantities and see how you feel. Myself, I consume grass-fed butter daily and seem to be fine with it, and will very occasionally (like once per month) indulge in a piece of raw, grass-fed cheddar. Generally, I don’t tolerate milk proteins very well. If you are still eating some grains and legumes, I would worry about getting those out of your diet first. But if you are still dealing with symptoms after a couple of months, it would definitely be worth reconsidering your dairy consumption. I’m concerned that kicking dairy out of my diet will push my calcium and phosphorus levels too low, especially because I am still nursing. What is the consensus in the Paleo world on absorbable forms/ food sources of calcium if I’m not doing dairy? Generally WAPF recommends calcium-rich vegetables in combination with butter to help with absorption. I’m just not sure what to do without dairy for calcium, especially because my teeth and my toddler’s need all the calcium and phosphorus they can get! My gut is in the process of healing, so I know I’m not getting everything out of food that I possibly can right now. Dairy is a contentious issue. Most people agree that it’s not good for those with leaky guts but that many people benefit from it after healing. As for food sources of calcium, phosphorous and magnesium, I think the best is bone broth. When you boil the bones, add 1-2 Tsp of vinegar to the water which helps to demineralization the bones (which means more minerals in your broth). I boil my bones for 36-48 hours,until they are so soft they are falling apart (you can eat these too, although they don’t have alot of flavor). Other great sources are canned fish where you eat the bones like salmon or sardines. Green veggies beside grass-fed meat ( or cooked in grass-fed tallow) would have the same absorbablility benefit as butter. While I don’t believe every single word I read..this raises some interesting points/questions which can help you start to research the topic. Hope this helps. When you say someone doesnt tolerate something are you talking about specific unpleasant symptoms of say dairy or is that inability to toleraate a generalisation for a leaky gut? My daughter is on the AIP simply because she cannot loose weight despite being Paleo for some time. She has never had any nasty obvious side effects from dairy at all but she has had to cut out dairy and so many other foods as her non weight loss is seen as a symptom of leaky gut. I AM SO GLAD you are writing this blog…I have fought this problem now for MANY YRS and just recently read “Wheat Belly” and then decided to check out Jimmy Moore again…wala..found your blog. IT IS REALLY HELPFUL. 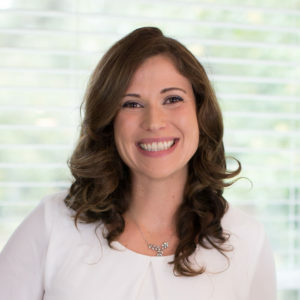 Also, according to Chris Masterjohn: “As I pointed out in my last gluten post, a recent paper by gluten researcher Dr. Allesio Fasano and colleagues found that intestinal permeability was even lower in people they judged as having non-celiac gluten sensitivity who had been eating gluten under supervision for four months when they compared them to control subjects, whereas those with active celiac disease had greater intestinal permeability. So, if non-celiac people don’t usually have a leaky gut, what are the mechanisms that makes gluten harmful to them? Great questions. So, no one really knows what starts the leaky gut. It may be a viral infection, stress, genetic susceptibility (like a variation of what happens in celiacs), medications, or a combination of many components of food that break through the mucus lining and allow damage to or alteration of the gut enterocytes. There is far more unknown here than known. Also, small changes in intestinal permeability can cause absolutely no symptoms in one person and huge symptoms in another, depending on how their body reacts to substances that might leak out. And these small changes may or may not be measurable with current techniques. 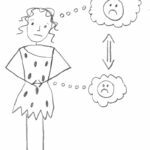 Why one person reacts and another person doesn’t is not understood (but very likely points to partial adaptation to eating grains, see this post https://www.thePaleomom.com/2012/07/why-arent-humans-adapted-to-grains.html). What is really interesting about the studies that Chris Masterjohn is referring to is that the volunteers with gluten sensitivity has an increase in a tight junction protein called Claudin-4, which might be the body trying to compensate for effects that gluten or other components of wheat is having on the tight junctions or intestinal permeability or could be an indication of a greater adaptation. Also, these patients had activation of the innate immune system (inflammation as opposed to adaptive immunity in which there is antibody formation)in response to eating gluten, but this study was not able to show why/how. The point of this study was really to show that gluten sensitivity is a different entity than celiac disease and point out the need for more studies on gluten sensitivity. The other limitation of all studies is how the “normal” group is chosen. If Prof. Cordain is right in that gluten causes increased intestinal permeability in the vast majority of people, then it’s hard to find a group of people unaffected to compare against in these studies. This might be why the variability in intestinal permeability measurements was so high in all of the groups in the study. 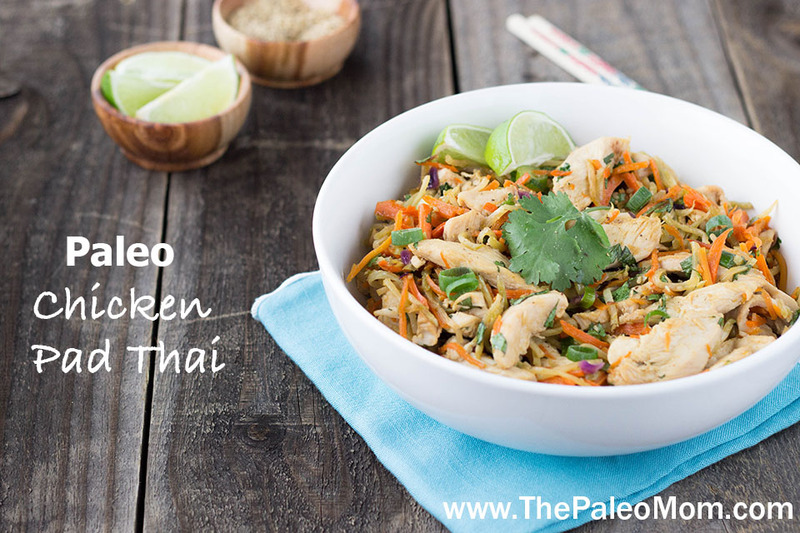 Researches are just beginning to understand how foods affect our bodies, which means that a diet based on this science (the Paleo diet) is likely to evolve as our understanding improves. For now, I think there is far more information pointing to gluten being harmful in the vast majority of people than the contrary. I think it’s systemic yeast…. Is there any way to *know* if you have leaky gut? Is there a test? Yes, there is a diagnostic test (Lactulose and Mannitol Test). It won’t tell you if your gut is only a little leaky, though. Yes, there is blood test. It’s new. My husband has battled loose stools for a while now. It is starting to get to the point where he eats something, and almost instantly he has to find a bathroom. He never has any warning beforehand. My question is does leaky gut cause diarrhea? I have been trying to tell him I think that is what he has, but after reading this, I am not sure. He is not Paleo, but I really think that he needs to try an elimination diet to get it figured out. Any advice or suggestions? I think autoimmune disease is originally caused by leaky gut, which allows large foreign proteins to come into the blood. These proteins cause low-grade inflammation through the innate immune system, but do not initially cause autoimmune issues. However, when an infectious agent is encountered, the infection ramps up the adaptive immune system and, because the leaky-gut foreign proteins are present, can cause the immune system to create antibodies to them as well, and to “learn” that these proteins are dangerous. So in the future, any exposure to these foreign proteins causes B cells to ramp up their antibody production and can cause T cells to ramp up as well. So with autoimmune diseases, the body is not trying to kill its own cells or create problems with its metabolism — it thinks it is fighting a serious infection, signaled by the foreign proteins leaking through the gut, or recognized by the gut-centric immune system. This explains why “just a sip” can cause a flare-up: it doesn’t take a lot to trigger a learned immune response. This theory seems to fit all/most autoimmune diseases, and when you eliminate *all* foods that trigger an immune response, the auto-immune disease goes into complete remission. Of particular note is that B-cell-created antibodies have a half-life of about 2 weeks, and eating a trigger for an autoimmune issue will usually cause a “flare” for 1-3 weeks. Elsewhere you say that each time you ate a trigger food, you had two weeks of flared lichen planus, and we’ve had similar experiences with our food sensitivities. This explains why taking digestive enzymes helps many people with auto-immune issues. The enzymes break down the larger proteins that would trigger an immune response. Also, wheat causes leaky gut whenever you eat it — so anytime you get an infection or vaccine and are eating wheat, that can cause it to turn from a low-grade inflammatory food to a trigger for a strong immune response. If you continue to eat it after that, you will have various auto-immune issues, depending on which particular protein sequences were targeted. Today I woke in so much pain. It was an all-night thing, my stomach, my hands, all the way through my shoulders to my feet. When this happens, I always say that it must be something I’ve eaten. I took leftovers with me today, which I always do, then sat down and decided to pick them apart. I thought I was doing the right things, as Paleo is new to me, so there must be a learning curve. Your site seriously helped. On my plate was (notice I said was – I threw them away) eggplant, green peppers, and tomatoes. As I said before, these were leftovers, from last night’s dinner; also included in that dinner, was paprika and other spices which were included in your nightshade post. While reading through each of your posts, I ended up here, and thought I should comment – “Thank You!” I have suffered from autoimmune disorders/diseases since I was very young. I had many very serious episodes where I was falling down stairs and tripping over things when I was very young. I would often cry, because I was in sooo much pain (before falling down). There would be so much heat radiating from my knees. Nothing could be found wrong with me. In my teens, I ended up with ITP, they eventually removed my spleen. Since, my thyroid has quit working, I suffer from “depression,” that is always the go-to diagnosis. My weight, can get away from me very easily if I do not monitor it at all times; however, when I was younger, I may have weighed a whopping 107 to 117 lbs. Each pregnancy, my hormones seemed to dictate tremendous weight gain, each time within a year I would be back down to my normal weight. Then my thyroid went, I’m sure you can imagine my struggles with that, physical and mental. I quit dairy a long time ago, still had problems. I’ve tried many diets, most recently decided on the Paleo diet. This seems to be working for me. But, as I said before, I’m still learning. Sorry about being histrionic, but I felt as though I should share, and let you know that I will be following your website religiously. I love that you used the work histrionic in a blog comment! Stress management and sleep are really important for thyroid function, as I’m sure you know, but just want to make sure there’s a focus on lifestyle aspects in addition to diet. 🙂 Good luck with your journey! Touché on the histrionics Not a lot of experience here in Blogger World, as seen by my using my real name. I’ll change that in a few. Anyway, yes, over the years (many many) I have made significant lifestyle changes. I quit smoking years ago. I was a longtime closet smoker. I’ve tried diet after diet only to give up and go right back to old habits. I exercise regularly, but then again, there are times I fall off that wagon. As to sleep, I’ve always been good at it; unless, my digestive system acts up. That typically will wake me at awful hours. Work can tend to take hold of me and cause a great deal of stress, I’m managing, and whose doesn’t. So, I do believe finding your blog is probably the best thing for me. I will have lots of questions as I read on. Thanks again! The same doctors tend not to laugh at “increased intestinal permeability”. There’s actually tons of research in this, so if a doctor is laughing, he’s not up-to-date. Tons of research? Weird that you don’t cite the papers. You also state in a previous comment that more is unknown than known. So, which is it? A careful scientist will try to avoid confirmation bias when seeking out and analyzing research data. I don’t see you holding to that standard. I agree with you. This is a very old post, written in the first few months after the creation of this blog. While the content is still accurate (explained in great detail in my book which contains 1200 scientific citations), it is a post I have been meaning to come back to, expand on several ideas, and add references to as I do with all of my scientific posts now. Although I am no scientist,there is one thing I can say is that having the condition is more proof than anything else.Of course it is always possible there is something else going on however, after eating food that is known to disrupt the gut barrier I feel a specific and pretty unique reaction every time.Usually within the hour after eating something like egg whites if it is going to happen, I can feel it go into my bloodstream( and not in the way its supposed to) and my whole body lights up, my pulse and heart rate quickens like my system is on red alert.Following this I will become irritable,tired and have a great deal of brain fog and depression the next day.It not an allergic response its not even like anything but what I would call specifically an autoimmune reaction. If I fall off of those foods for a few weeks and let my stomach heal I can eat them again without a reaction because my stomach lining heals but its only a short period of time before it starts again if I keep eating those foods known to disrupt the gut barrier. I tell ya its an odd ,odd thing! Hi Sarah, Ive done the autoimmune diet for a number of months and done very well. Upon introducing foods back in I would be great with them for a while but then it seems with time these foods would how do I say, rip my stomach open all over again?It seems my leaky gut really never heals.I will get some healing in,reintroduce new foods, be okay for two to three weeks or so and then be almost back to square one overnight again.What do you think.. does this mean I should just forget reintroducing all together, or should I go for something like two years or so before even thinking about trying new foods? Thanks! Dr. Wolfgang Lutz – original author of the (german text) “Leben Ohne Brot” (now also in english with an american co-author) clearly documented in his thousands of lo-carb healing attempts on patients – that some people take 6 months while others 5 years and some never really totally “recover” but just do better at one level or another. I think you are right Sarah, that the myriad of factors – genetics, damage done, types of foods and on and on affect the eventual outcome. my partner did brilliantly after a lifetime of neuro-dermatitus after changing to a Paleo diet – but upon returning to native switzerland and the creeping in of a little dairy here and there, the dramatic reduction of sunlight in her life (we lived in the desert in the southwest at the time of her best healing) and the substantial increase in stress dealing with creating a new life in her home country (old patterns grabbing hold again…) led to a serious eruption of her autoimmune disorder and we think, the destruction of her intrinsic-factor producing cells in the stomach – pernicious anemia resulting. it is sooooo complicated a condition – which is why conventional medicine is overwhelmingly clueless – there is not way to get a definitive determination and then shoot the condition down with a magic big-pharma pill. day by day – is all i can say….. Thanks Sarah, no you actually helped alot with that answer.That was what I was already suspecting. I think I get so excited about a new food (like egg whites) that I think I start overindulging too much and then that’s what causes me problems. I think if I kept them down to once a week or so it just might work so Ill do some experimenting when I heal up again. I find your blog so informative, thank you for educating people like me 🙂 I’ve been dealing with food sensitives for years and I had no idea. I constantly had swelling in the ear, throat constriction etc but couldn’t figure out why. Even got allergy test done, nothing showed up ( no food allergies) except for severe environmental allergies. After suffering from these allergies for quite some time, 3 years back I found out I’m hypothyroid and have Hashimoto’s. I started eliminating foods from my diet. I started with soy, followed by dairy. Going dairy free made an amazing difference, my acne disappeared, so did my heartburn and my digestion improved greatly. I always ate well and worked out, but for some reason I developed a belly. Going off dairy, that spare tire disappeared. I’m pretty sure that it had more to do with inflammation, then anything else. Now, to my question. I’ve gone egg free and gluten free too, 10 days back. Ever since I went gluten free, I noticed that my stomach started to swell up again, it’s like some kind of inflammation is back. I’m trying to figure out what’s going on. Could you kindly shed some light on this, would really appreciate some input/advice. It’s hard for me to know for sure. There’s certainly some adaptation that can take a few weeks when you go gluten-free (it can change how quickly the muscles around your intestines contract, which should normalize again in a few weeks) and change the amount of mucus produced by the cells that line your intestines, which also affects transit time. For me, the most important question is what did you replace those foods with? Are you eating lots of vegetables? fruit? rice? I think it might be a question of what you’re eating more of rather than what you’re not eating. That feeling of a bloated belly can have a lot to do with gut bacteria levels in either your large or small intestine (FODMAPS sensitivity is something to read up on, given that going dairy-free made a difference here) and can also be related to stress (for example if eliminating gluten and eggs means you’re really low carb now, or if you also aren’t getting enough sleep, or if you’re increasing your intake of a food that you’re actually sensitive to). I know none of these are definitive answers, but hopefully this helps. After I did my elimination diet I identified three reactions to different things. The first was an autoimmune reaction to certain foods ie it crossed the barrier and set me off for three days. The second were foods I just couldnt digest well, and the third and actually most frequent were basically pretty much any ingredient that wasnt 100 percent natural. Even the most basic additives like citric acid killed my stomach.I also got the same gnawing, nagging pain from grains, beans and nuts due to lectins I suspect. After about six or seven months of eliminating all irritants its gotten a little better but its still there when something slips through. Ive found the gluten has been the easiest thing to eliminate, but its all the other stuff that I battle with more. It forces me to stay healthy but my question is, just what causes the aching pain with certain ingredients and foods?Is it that my villi is just maybe still so blunted that it cant digest anything or, do I maybe have sores on my stomach that are sensitive to the fake stuff? It sounds odd I know but that’s what it feels like it aches so bad! To be honest, I’m not really sure what would cause the pain. It could be damage, but it could also be things like autocrine or paracrine release, or even certain hormones. I think it’s still a good idea to listen to your body, but I really can’t tell you what that pain means physiologically. The increased sensitivity is due to changes in the immune system (the cells that react last longer than the cells that normally restrain the reaction). It should diminish over time (although that can take months and even years for some people). Thank you for sharing! I did not read the entire thread, so please forgive me if it has already been answered… I’m curious how can leaky gut be confirmed…. is there a specific test? There is a test called a lactulose-mannitol test that can detect more severe cases. It’s fairly controversial how sensitive the test is and many people believe the false negative rate is high. This can be done in conjunction with stool and urine analysis for gut dysbiosis though (I think it’s the Metametrix Organix test) and those two tests together can be very enlightening for diagnostic purposes. “all disease starts in the gut”…. 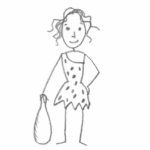 I’m almost positive I have SIBO/Leaky Gut, but the strange thing is that I was fine before I started following a Paleo food plan. I started eating a Paleo diet in December to clear out the processed food and dairy I was consuming a lot of. I was successful and felt great for a few weeks in terms of better tolerance of my arthritis pain and I lost some weight, but digestion issues came with along with those positives. At first it was constipation, but now, almost three months in, I have extreme bloating (I seriously look six months pregnant), a bacterial vaginal infection, which leads me to believe my body is riddled with bad bacteria right now, and constipation, cramps, the works. I am miserable. I am doing probiotics and kombucha and it helps only a teeny bit. 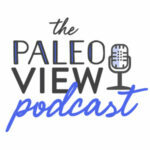 All the research I’ve done for people with SIBO/Leaky Gut say to eat a Paleo Diet … yet that’s what got me in this position! So now what?! I’m tempted to get my doc to prescribe a really strong antibiotic to wipe everything out and start over. The idea of waiting two years to undo what I did to myself with the best of intentions is very frustrating. A few things you could try. We recently found out we were sensitive to coconut oil, and it was causing us to bloat after every meal. Cutting out coconut oil altogether made a big difference. We are going to try reintroducing it after a couple of weeks, at very low dosage. Another possibility is that you need more carbs, because the mucosal lining of the gut needs them, and if you don’t have what you need, it can cause gut/digestion issues. Another is sensitivity to nuts. You could eliminate them altogether, if you haven’t already, and see if that helps. hi Paleo mom. i am struggling to establish whether i should be on on the pale diet or the autoimmune one. after years of IBS-like symptoms, especially bloating, and sustained depression and anxiety and i am now experiencing extreme fatigue that is made much worse by doing ANYTHING that involves any kind of exertion. i recently had an endoscope to explore my extreme reflux that found a 3cm hiatal hernia but what concerned me most was the fact that they could still tell me what i had for breakfast 7 hours later. my stomach was still pretty full and full of acid. i am just at a loss. i am waiting for biopsy results to come back but all they have prescribed until them is PPI’S. i would be so so grateful for any advice. Do you you thin i have leaky gut? many many thanks. clair. I had the same thing happen to me. When I had a he scope done you could still see the food I had the day before. My friend recommended a naturopath, he completely cured me. He explained how all the things he was giving me to take was repairing the lining of my esophagus and intestines. I would recommend you looking for one, changed my life. Drs wanted to put me on med for delayed stomach emptying and when I looked up the side affects of the med there is as no way I was going to take it, that’s what made me try the naturopath, that was 5 years ago and it only took 1 month on regiment to be cured, some take longer. Good luck! Thank you so much for the amazing info you provide in such a simplified way. Really helpful to myself and my family, great work! God Bless! While a “leaky gut” (or intestinal permeability) is a phenomenon recognized by mainstream science, the existence of a condition called “leaky gut syndrome” is supported mostly by nutritionists and practitioners of alternative medicine. These supporters say that undigested food particles can pass through the “leaky” bowel wall and into the rest of body, leading to a large number of conditions ranging from migraines to autism. As of 2013 the theory, according to the UK National Health Service, is “vague and currently largely unproven”. Seth Kalichman has written that some pseudoscientists claim that that the passage of proteins through a leaky gut is the cause of autism. However, a review of the effectiveness of remedies designed to “treat” this found them not to be effective. A 2013 review said that the connection between leaky gut and autism had aroused controversy, and that within the scientific community this debate was continuing. A 2008 article said the relationship between a leaky gut and diabetes-prone animals and humans is poorly understood, and that more research is needed. Another 2008 study said that the relationship between substance absorption by the digestive tract and chronic heart disease was unclear, and that further study is needed. Hi, I suspect my husband may be suffering from this “leaky gut” thing but of course, I don’t know for sure. He always says he feels best when he doesn’t eat anything at all. What is the best way to start learning more about this? I have wanted to read Wheat Belly for awhile now, would that be a good place to start? He has major issues with bloating. Where can we learn more? And possibly start the Elimination Diet I have been reading about here? We are both extremely busy people & I want to help him if possible, so just need to know step-by-step what to do to help him as efficiently as possible. Thank you! What if I have done the AI protocol for several months now and still cannot lose weight despite eating only low fiber semi starchy veggies clean meat and mostly fat. I use bone broth too. My gallbladder was removed at age 18 (stones) and I was diagnosed with a duodenal ulcer at age 20. I was diagnosed with peptic ulcers at age 22. I’ve been careful with my diet (as recommended by doctors) and taken every medicine from Aciphex to Zantac and I still have the exact same conditions – proven by endoscopic procedures in 2000 and earlier this year – at age 51. I’ve just begun to explore leaky gut, SIBO, and Paleo and will, of course, discuss this all with my doctors – but because all of this is so logical and makes so much sense to me, I’m going to make some serious changes with or without their approval. Something is just not working when 30 years of treatment goes by and I still have the exact same problems. Hi, I have hypothyroidism and I take medicine for that. I’ve been bloated for a year since I lost a lot of weight. I’ve had all the test you can have done and they are saying theirs nothing wrong. I say why am I bloated for a year. How do you know if you have a leaky gut? My son (9) had eczema. With taking the dairy and grains out of his diet it was manageable. But he now seems to have overgrown it and can eat anything without getting a reaction. I had the same when I was a kid and I have heard others who also overgrown it. How does this happen? Does the leaky gut close at a certain age? Does it open later on. Would love to hear more about this, but can also understand if there is no knowledge about this (yet). If only such important information were available ‘back-in-the-day’ I would not be suffering so. I’ve dealt with lupus all my life and NEVER have I encountered such wonderful information! Having just read an article from the Lupus Association, there was a mention of ‘nightshades’ and I had no idea what they were talking about. That article lead me to you. Praise the Lord I found you! Hi! I have a question about leaky gut. I have been trying to solve a problem for the past 4 years and have tried so many different things with trial and error and I haven’t been able to pin point exactly what is wrong. My blood test shows elevated liver enzymes and high bilirubin and I also experienced intussusception of the small intestine and flare ups on my scalp. My question is: Do you think this could be caused by leaky gut or some kind of food allergy? I typically experience discomfort on my upper left side after some meals and I have random flare ups of seborrheic dermatitis on my scalp. Fatigue and mood swings can also follow.. I’ve tried elimination diets and I haven’t quite been able to pin point the problem yet. Do you have advice on what to try next or thoughts about the root of the problem? Thank you! I had the same. Horrible itchy scalp and only one dandruft shampoo which would calm it down. Since I eliminated dairy, grains and legumes from my diet I have nearly no itchy and flaky scales. I can wash my hair with normal shampoo too. Every now and then I do eat some beans or a product with milk or grains in it and the first things I notice is that my scalp flairs up. Hope this is helpfull. I just saw your reply and would like to hear more about how things with your scalp and gut have been. I have been trying no gluten, dairy, sugar and alcohol and have become very suspecting of dairy but never heard of legumes are being a problem. So grains, legumes and dairy are the main culprits for Leaky Gut and having an itchy scalp. Did you experience hair loss from the itchy scalp? Thank you for this article! My doctor just diagnosed me with chronic inflammatory response syndrome. It’s inflammation all over your body and I assume is related to leaky gut because I was also diagnosed with biotoxin illness from toxic mold. I have skin rashes, constant nausea, continuous headache and chronic swollen lymph nodes. Things would have been so much worse if I wasn’t already following a Paleo diet. Now I’ve got to be on a low amalose diet but I don’t know what that is. I heard its similar to low histamine diet. Any suggestions? Hi there, I have just done 45 days of the AIP diet and am now introducing food. I am doing this to prevent autoimmune disease which I have in my family history but also to help with endometriosis. I used to get eczema as a child and have noticed I get itchy after re-introducing certain foods e.g. dairy and chocolate. Just wondered if I can do the IgE blood tests for all foods and spices and will this just tell me what foods I should avoid to help with gut healing? Is the Ige test the same as the RAST testing? Is this useful for us trying to heal leaky gut and prevent autoimmune disease? Love the Blog so much. It’s been an absolute fantastic help in figuring out and more importantly explaining my recent diagnosis (Hashimoto’s) to friends and family. I’m fascinated by the science you lay out here. I’m wondering, if the negative autoimmune response is brought on by a sort of miss identification by the immune cells would it be possible to pinpoint what protein sequence is causing the flare up and it’s ‘look a like’ that is already in the body. I think what I’m asking is once it’s a case of mistaken identity will the immune system attack any short system amino acids in my body even if I steer clear of ingesting the guys that make it act crazy? I’ve not studied science at any length so correct me if i’m wrong, but as I understand it it’s sort of like racial profiling. The immune system, antibodies (police) arrests a bad hunk of cheese (ethnic minority) now the antibodies (cops) thinks that all the amino acids that look like the guys they caught are the same. So all the ethnic minorities (amino acids) in the neighborhood are getting beat up by the cops (antibodies) without due process (enterocytes). Simplification I know, but if one were able to identify what the amino acids that came with the cheese are could we know to avoid those so that the antibodies don’t also attack the good guys that are already apart of the system? Oooor am I way off base. Again science was never my strong suit. Could I please get the source for this information please? I would like to learn more on this topic by reading the relevant journal articles that this information comes from. Unfortunately I am not able to give you specific medical advice in this sort of setting. I recommend you find a good functional medicine practitioner who can guide you, rather than the other way around as it is for you right now. That can make all the difference. You could also check out The Paleo Mom Consulting and do a free ten minute consult with one of my consultants to see if they can help you. Good luck! But tell me, what HIV/Aids have to do with a leaky gut?? ?